Head down to your local electronics store and you will no doubt find the shelves of budget headphones are more densely populated than an ant-hill, so it really does take a special pair to stand out from the crowd. It is an industry in which it is difficult to innovate products, and perhaps even more challenging to change the customer’s perception of a good product, but when we first heard about these Urbanears Medis earphones being released, we were looking forward to testing them out. At the end of the day, when you are buying in-ear headphones, you are usually looking for one of two things: either a great sounding premium pair, or a cheap and cheerful pair to get you by. So, it was interesting, if indeed taxing, to review the new UrbanEars Medis Earphones and find that little bit of individuality to set it apart. Usually such a product wouldn’t warrant its own section in a review, however I would like to give a special mention, not to what is in the box, but actually the box itself. It is an attractive design and as we well know, first impressions are everything. The square box is divided into 3 sections, one of which is twice the size of the other identically sized ones, and occupies half of the box diagonally. Each compartment contains various things, some interesting and some pretty mundane, such as the instruction manual. However, once you have taken everything out you will simply find yourself with a pair of headphones and a couple of traditional 3.5mm extension adapters as well as a booklet containing information on the company, latest products and a warranty. It really is exciting stuff. Urban Ears pay close attention to the style and comfort of their headphones. They have, in fact, patented their EarClick design of the earpiece. The product also, interestingly, features 4 sizes of earpiece, which are interchangeable, which is great considering the default pair were far too big for my ears. Although, when you actually try and replace them you find that only the earclick piece is removable and therefore it never really makes much difference. I found that they were occasionally fiddly to get into place and once in were far from discrete and fairly uncomfortable. Having said that, perhaps I just have abnormally sized and shaped ears, but there was never a time where I wasn’t aware of their presence. Before I move on, however, there are a couple more notable aspects of the design and quality I would like to touch upon. The first of which is that instead of the plastic wiring found on many traditional headphones, such as the ones you get as standard with the latest Apple iPods, Urban Ears has opted for an almost string-like material to encase the wiring, which has its own pro’s and con’s, such as the fact that it does indeed lessen (not remove) the age-old problem of entangled wires, however it does being to fray and lose its visual appeal after an extremely short time. The earphones actually incorporate a couple of nice features, such as the very limited controls found just below the earpiece on the left ear. From here, like the Apple headphones, you can simply play/pause your song via a single button, however the interesting addition is the built in microphone, which is not bad quality, all things considered. The sound quality though, is a little sketchy. Whilst in normal use it is OK and comparable to the wealth of other budget headphones knocking about at a range of volumes, however one relatively minor qualm I have with the product is the static feedback when you adjust the 3.5mm connection in the jack. Perhaps you simply twist it in your pocket by accident you receive a short burst of unwelcome feedback. Overall an uninspiring pair of earphones, and throughout the review you may have recognised my constant comparisons to budget options such as the Radiopaq Dot earphones, as this is the quality I believe they deliver. However, when you consider the price is an astounding £44.99, you will no doubt be as appalled as I am even though they are available in a variety of colours, perhaps you’d be better off waiting for Sony’s ‘Designed for iPod’ earphones. The sound quality is nothing special, though not bad and finally they are far from comfortable. 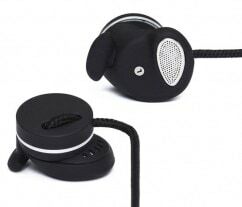 So, with great regret, I think the simple sentence that will sum up my opinions on the product is this: the most exciting thing about these Urbanears Medis Earphones is the box.